Horses have been important animals to humans for thousands of years. They are used for transport, racing, herding and show jumping to name just a few of their uses. Build any type of Minecraft horse enclosure; use signs to label the different areas for visitors. Remember to sent me a screenshot or a link to your blog of your build. * Question: What is the difference between a horse, donkey and mule? 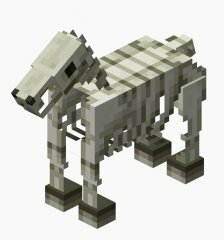 Challenge: How do real life horses compare to Minecraft horses? This weeks challenge was suggested by Samuel on the ideas wall, thanks Samuel. Howdy! I just want to offer you a huge thumbs up for the great information you have got here on this post.